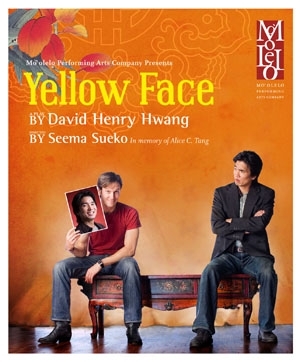 On Thursday I went to the last preview performance of Mo’olelo Performing Arts Company‘s production of Yellow Face, by David Henry Hwang. If you live in San Diego, go see it! It opened last night and plays through the end of the month. The play is a fictionalized autobiography, with Hwang as the main character, played by Greg Watanabe. Searching for an actor in his new play Face Value, Hwang casts Marcus G (Brian Bielawski), whom he thinks might be Asian. When he discovers Marcus is white, Hwang tries to give Marcus a backstory as a Siberian Jew (and hence Asian), but eventually fires him. The play flops weeks later, and Marcus and Hwang go their separate ways. Years later, Hwang discovers that Marcus has started to pass himself off as Asian and has become active and a bit of a celebrity in the Asian-American community, especially for political causes. Hwang finds Marcus toxic; he berates his ex for dating Marcus, he feels isolated. Hwang’s father and Marcus both become persons of interest in a congressional probe into Chinese financing in the US. In the end, of course, everything has to come out in the open. In part, I read the play as Hwang dealing with the discomfort of being the spokesman for Asian-American theater and the expectations that come along with that. It also brings up the discomfort felt by Asian Americans (or anyone, really) when their struggles or concerns are co-opted by well-intentioned but overzealous white people. The historical context encompasses three moments in the 90’s : the casting in Miss Saigon of Jonathan Pryce, a white actor playing in yellowface, the 1996 campaign finance investigations into “Chinese influence” in US elections, and the 1999 railroading of Wen Ho Lee (the program has some dramaturgical notes in case you were asleep or too young in the 90’s). The play uses these events to frame Hwang’s vacillation between caring about the issues and being repulsed by Marcus’ involvement; Marcus uses his “yellowface” for good ends, but in the end he’s a poseur. There’s a lot going on, and director Seema Sueko does a great job of keeping all the balls in the air while maintaining the narrative thread. The play is a farce, and while the madcap energy that the actors bring to their performances felt a little too extreme initially, in the end it felt necessary to keep the momentum going. I found the text a little uneven; the major climactic scene in which Hwang has it out with the yellow journalist from the NY Times is almost too measured and serious. Perhaps it’s the political climate we live in now — in a muckraking environment, an argument about blatant bias feels real, rather than absurd (or even hyperreal). So if you’re in San Diego, see this show — you’ll learn something! UPDATE : I edited a bit above and realized that you could describe the NY times reporter as practicing “yellow journalism.” An implicit double entendre? I laugh! This entry was tagged asians, San Diego, theater. Bookmark the permalink.